Benetton Let's Move is designed for true athletes and freshwater lovers. 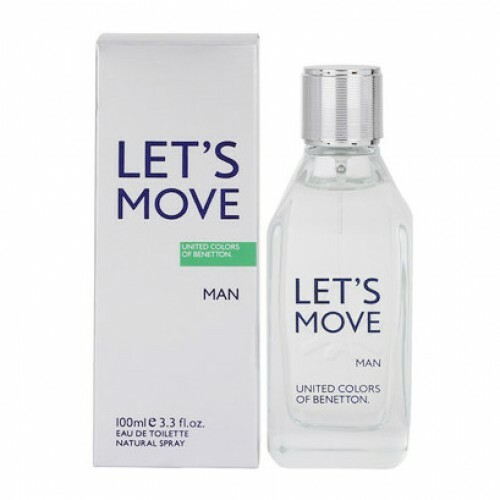 Benetton Let's Move For Men 100ml. EDT designed for a dynamic man, always moving and lover of the sport, the fragrance opens with an energetic cocktail of citrus enhanced with black pepper. A cocktail of aromatic notes is his heart, refreshing and invigorating the fragrance that reinforces the male cedar. Their wake, thanks to keeping warm amber and balm leaves an indelible mark, delicate and sensual. Benetton is an Italian luxury fashion brand founded by three brothers and one sister of the Benetton family in 1965. Oldest brother Luciano Benetton recognized a growing market for colorful clothing and bought a knitting machine, issuing the company's first collection of sweaters and selling them from the back of his bicycle. The sweaters sold well in the region, and Luciano invited sister Giuliana and younger brothers Gilberto and Carlo to form the Benetton Group which would oversee the company. Benetton Group today offers clothing for children and adults under the Benetton brand, as well as brands Sisley and Playlife. Benetton Group companies have stores in 120 countries.Perfumes for adults and children are also marketed by Benetton, in conjunction with Selective Beauty .